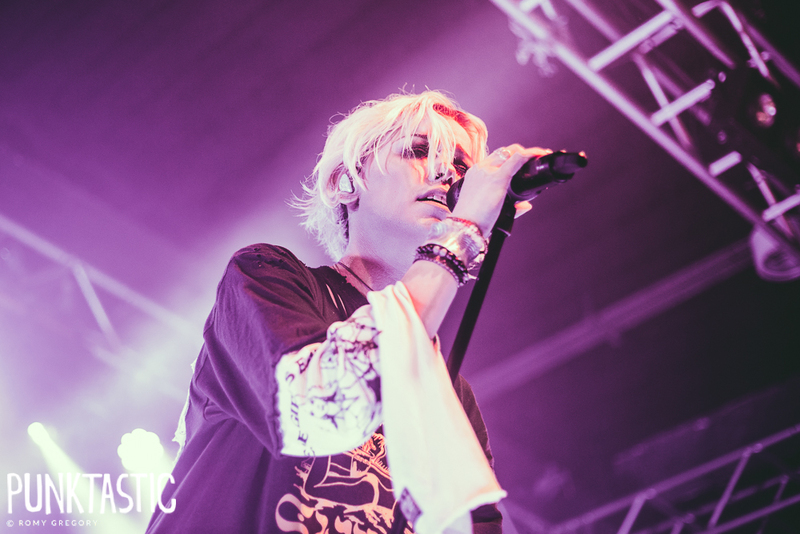 It’s no secret that Tonight Alive adore London – often describing it as their second home after Sydney, Australia – and on this particular evening, London showed up in full force, ready to prove just how welcome this four piece is in our city. It was to be the first of two nights in London; a fully plugged set in support of their latest album, ‘Underworld’, ahead of an acoustic evening to celebrate 10 years of TA, during which we would be able to rest our broken bodies. Tonight Alive’s live shows are fierce. Jenna McDougall’s stage presence cannot be compared to any other front person in the pop-punk genre as she struts and jumps across the stage, screaming the lyrics as dedicated fans scream them right back. There is something about the four of them that creates an indescribable sensation throughout the venue, taking tracks that you thought you knew inside out and making them sound brand new. Giving their music new life what makes Tonight Alive such a strong live band, as it allows you to experience their music in ways that you never could through your headphones. This, combined with Jenna’s spirituality, ensures that everyone in attendance leaves the venue feeling more fulfilled, as well as inspired and motivated to achieve greater things than they could ever have believed possible. Prior to launching into ‘The Other Side’ track ‘Say Please’, Jenna took a moment to perform some of her poetry, which was taken in quietly and respectfully in the knowledge that this art is just as much a part of the live show as their music, and just one more way that Jenna is able to express herself through creative talent. It is urgent and forceful, yet at the same time forgiving and patient, and this encapsulates much of who Jenna appears to be. The fierce yet soft nature of this band is intriguing, and you’re automatically drawn in to listening to every word that comes out of Jenna’s mouth. She is ethereal and unbreakable; the kind of person who has endured pain but has only become stronger and more empathetic as a result. With the heavier nature of the band’s fully plugged sets, the crowd took the opportunity to lose themselves in the pit, and as they slammed their bodies against one another, you could see nothing but joy on their faces. Live music should be something that allows you to forget what lies beyond the confines of the venue’s walls, and Tonight Alive always achieve this without fail. ‘Crack My Heart’ was introduced as being about divine feminine liberation, and it was a truly freeing experience to throw yourself into the sea of people and let go of every social confine that has been placed on us. Tonight Alive make you feel special, giving shout outs to particular fans that have been around for a while, in particular the young couple that got engaged on stage on their UK tour earlier in the year. This shout out was followed by a performance of ‘For You’, the song that followed their engagement in March, and this time it was being filmed for the music video that would accompany the track. Later on, ‘Waves’ would be dedicated to a fan who travelled all the way from Greece for the show. This is a band that cares about their fans, always acknowledging that they would be nowhere if it wasn’t for us. This gratitude was evident throughout the set and reached its peak during the final few songs, ending with the endlessly entertaining, ‘Temple’ which saw even the most hesitant crowd members completely lose themselves in the moment. It was a sight that caused unfaltering grins on the band’s faces, and Jenna noted that she wished she “could bottle this and take it with [her]”. As she started to sing the line “I will be better” from ‘Human Interaction’ and began to walk off stage, I’m sure every person in the crowd wished they could bottle it and take it with them, too.